Instead of £560.00. You save £28.00 due to the online discount . 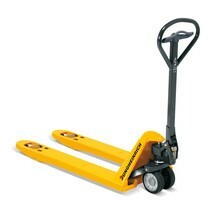 The AM 22 pallet truck with 2,200 kg capacity offers premium, tried-and-tested quality from Jungheinrich. The distance across forks of this special version measures 680 mm, making it ideal for transporting wide special pallets or sideways lifting of Euro pallets. The quick lift function (up to 120 kg) saves you time and energy. Thanks to the short fork length, the pallet truck can be easily manoeuvred in the tightest of spaces. The Jungheinrich AM 22 hand pallet truck with a capacity of 2,200 kg is a premium product combining tried-and-tested Jungheinrich quality with sophisticated equipment. This special version of the AM 22 features an extended distance across forks of 680 mm, making it ideal for transporting wide pallets. When lifting pallets from the side, the embossed marking on the fork arms indicates the exact and secure positioning of the load. 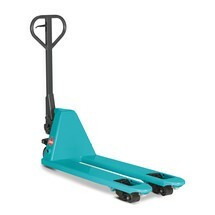 Sideways lifting of Euro pallets is facilitated by the sophisticated design of the fork arms. Thanks to the quick lift function (up to 120 kg), you can raise the pallet clear of the ground with just three pump strokes. 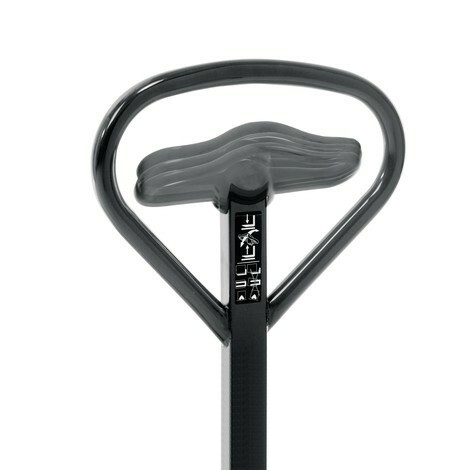 The maximum lift height is reached after two additional strokes. This provides you with valuable assistance, which is tangible with every new load. Thanks to the short forks, reduced headlength and 105° steering angle on both sides, the hand pallet truck is extremely agile. This ensures safe, straightforward use of the AM 22 in even the tightest of spaces, such as in narrow aisles or on trucks. The patented, ergonomic Jungheinrich operating concept allows the tiller to be controlled from any position and is equally well suited to right and left-handed users. All functions can be easily operated with one hand. Thanks to the special lowering valve, sensitive loads can be set down with utmost control and precision. The outstanding stability and durability of the product is ensured by heavy-duty steel, a sophisticated design and a welded tiller mount. The steel construction is torsion-free and very hard wearing. As a result, the AM 22 retains its shape even when carrying loads of up to 2,200 kg. 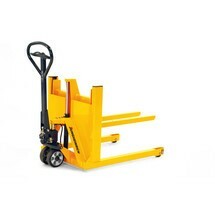 The hand pallet truck does not require any servicing as the connections are lubricated for life and the pump hydraulics are maintenance-free. 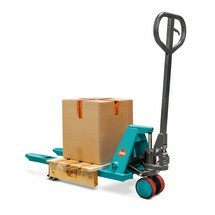 The covered entry rollers and rounded fork tips make insertion and retraction from the pallet particularly easy. Depending on the ground conditions and specific application, you can choose between a range of wheel and roller materials. You can also opt for single or tandem fork rollers. Order the Jungheinrich AM 22 hand pallet truck with quick lift, special distance across forks and short forks from our shop in your chosen configuration.